PalmSHIELD horizontal louvered screening is perfect for providing excellent ventilation while keeping items out of sight from others. Using the industries’ only picture frame design, each panel is rigid enough to stand on its own. Maintaining a consistent design throughout the system, PalmSHIELD can be configured as a series of screens, grills, swing gates and even sliding gates. PalmSHIELD is custom fabricated to each application, allowing end users to select the amount of visibility and air flow by varying louver spacing. PalmSHIELD is unique in providing the industries’ widest louver. Each louver is .1250 thick with an installed profile of 2” x 2.873” tall. Not only is the PalmSHIELD a larger profile but the entire profile is sloped providing less visibility and better air flow. Only PalmSHIELD uses a 3” x 3” x ¼” angle vertical supports. Each louver is welded to the vertical supports. Because of the larger vertical support, PalmSHIELD provides a 2 ¾” weld-able surface to attach louvers to the frame. PalmSHIELD uses a 3” x 3” x ¼” angle top and bottom cap. Most systems do not provide a rigid top cap. A top cap is criticalin protecting the panel from falling debris, hail, etc. while the bottom cap protects the louvers from foot traffic and mowers. The vertical supports and horizontal caps are welded together to form the industries’ only picture frame design. This design provides a rigid framework to support the louvers. PalmSHIELD uses a 2” x 1/8” aluminum flat bar not to exceed 24” apart to support the louvers between the framework. This support prevents intruders from attempting to spread the louvers apart to gain access. Larger than most systems, PalmSHIELD uses a 4” square x ¼” or 3/8” wall post. The larger and thicker walled posts is suited for high wind and snow loads. Posts typically do not exceed sixty inches on center. All nuts, bolts and fasteners are stainless steel. If gates are incorporated into your system, only our Gorilla hinges will be allowed. After fabrication is completed, all materials are carefully sweep blasted and powder coated. The most important part to any coating system is the preparation of the materials. Sweep blasting removes any foreign debris and opens the aluminum up for adhesion. Custom colors are available. PalmSHIELD uses polyester powder coating in accordance with material hardness ASTM 3363 2H. PalmSHIELD is an excellent choice for any architectural and mechanical equipment screening, enclosures, rooftop enclosures, trash enclosures, etc. 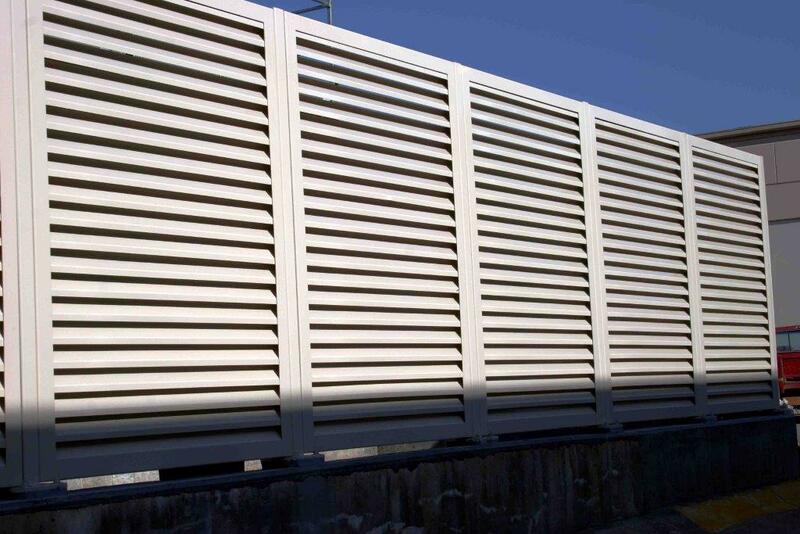 PalmSHIELD louvers standard design uses a ½” overlap based on direct visual screening. Direct visual screening is the standard measure for determining the percentage of visibility. It is exactly as it is described. Based on looking head on at a perfect horizontal plane to a louver that is installed plumb, can you see through the louvers? Any visibility at this vantage point is a percentage of visibility.